Apple Pay allows customers to make purchases in iOS mobile apps using Touch ID on the latest Apple devices. Users are able to add their credit or debit card information using a tokenisation service which encrypts the card number. The service uses a device specific identifier known as the DPAN in place of the card number to handle transactions securely. Apple Pay requires the customer's card issuing bank to be part of the Apple Pay program with Visa, MasterCard and American Express supporting the processing network. To integrate with CityPay and Apple Pay, you will need a merchant account via CityPay and a developer account with Apple. You will need to download a CSR (certificate signing request) from CityPay (Currently this is handled via support@citypay.com). Download the created Apple Pay Certificate and return this to CityPay (via support@citypay.com). At this stage, we will configure your account with the generated certificate to allow us to decrypt payments. Apple have specific identity and user experience guidelines which may be enforced during the App Store review process. 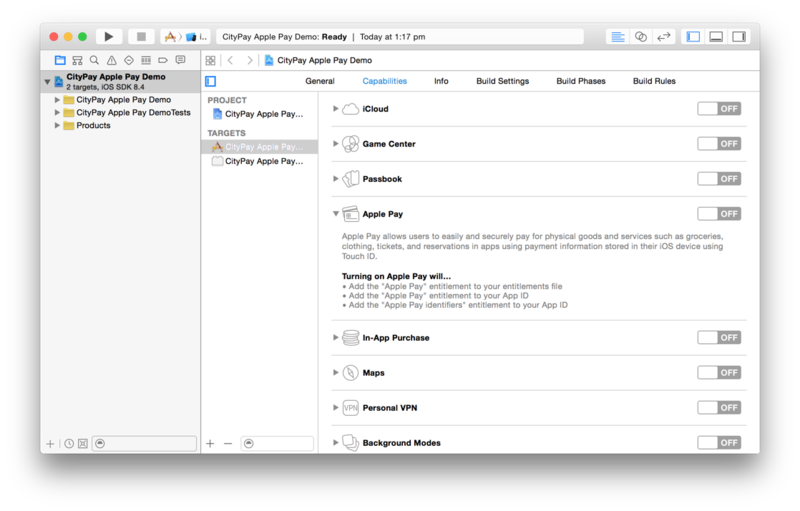 You should consult these guidelines as well as Apple's developer information guide when designing your app. CityPay provide a development kit for iOS which integrates directly with Apple Pay. The SDK supports integration with a PKPaymentAuthorizationViewController and allows you to adapt processing to a CityPayRequest instance. This integration method was chosen to provide full control and configuration of the Apple Pay workflow whilst simplifying the transactional process to our implementation. canMakePaymentsUsingNetworks determines that the device can use the given network. The actual decision on this is complex and determined by Apple and the Card Issuer. @IBOutlet weak var applePayButton: PKPaymentButton! Apple Pay is centralised around the PKPaymentRequest which should be used to initialise the Apple Pay payment. The currency code must match what you can process with your CityPay merchant id. Once the user has authenticated payment a delegate of the controller runs the payment authorisation process. This is where we implement the CityPayKit into the Apple Pay process. provide the CityPay merchant id. This should match the processing currency of your transaction. provide the CityPay licence key which is used for processing Apple Pay payments. provide a Bool value whether the transaction is for testing or false for production. a paymentResponse closure which provides an instance of the CityPayResponse object outlining the result of the transaction. This is included to determine the result of processing and therefore update your systems accordingly.